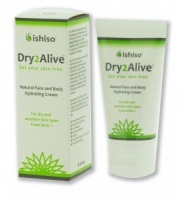 Dry2Alive Face and Body Hydrating Cream is a revolutionary product which helps in the management of dry skin. It is different from other products as its mild formula can be used effectively on both adults and babies providing deep moisturisation for the most sensitive of skin. You will find that it is not sticky and absorbs quickly into your skin leaving it feeling moisturised for the entire day. Mild essential oils provide a fresh uplifting scent which is suitable for you and your whole family. Its mild formula has natural actives like Baobab oil, Rosehip and Borage Oil and Colloidal Oatmeal which have been historically used in the treatment of dry skin conditions like eczema and psoriasis. It also contains Marshmallow oil which has been historically used to reduce itching which can be a particularly annoying side effect of having dry skin. At ISHISO we believe we can make a difference to the quality of your skin. Dry2Alive is our revolutionary product and we recommend you do not delay trying our product. Set yourself free from dry and irritated skin and enjoy life! Dry2Alive Face and Body Hydrating cream has been formulated with naturally active ingredients that have been historically used for their replenshing, hydrating and soothing benefits on dry irritated skin.